The Spectre x360 15-inch is an outstanding laptop served with a side of 2-in-1 versatility. We concluded following CES 2017 that 2-in-1 devices — that is, touch-enabled PCs that can convert from standard notebooks to tablets, often with other modes in between — are becoming the new normal. Between Windows 10 offering a much-improved touch experience and Microsoft’s Surface line blazing a trail, manufacturers are trending toward making as many 2-in-1s as they are traditional notebooks. That’s a good thing, because many 2-in-1s are excellent machines no matter how you use them. In fact, some 2-in-1s are so good you could use them as standard notebooks, and completely disregard their extra flexibility. In our HP Spectre x360 15 review, we take a look at one such machine that pairs a convertible format with a large 15.6-inch display. The Spectre x360 15 offers hardware that competes well with most traditional notebooks. 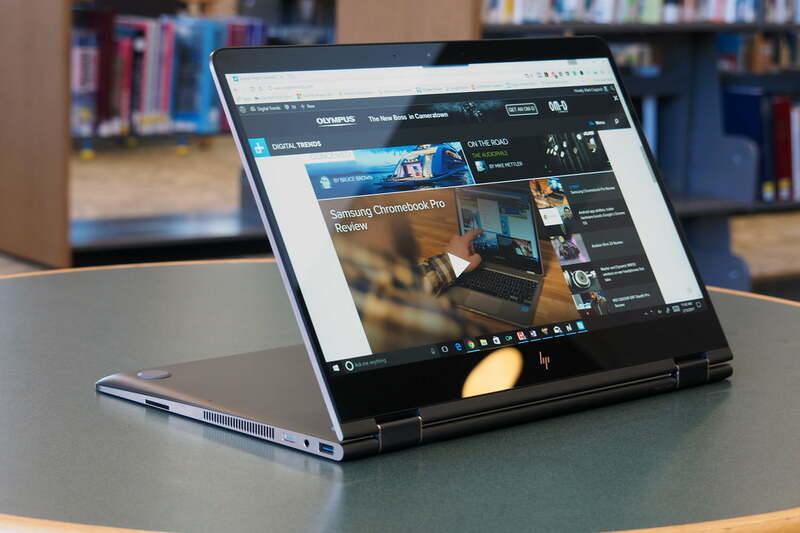 After HP quietly updated the line in September 2017, that means a quad-core eighth-generation Core i7 processor, 15.6-inch 4K display, refreshed Nvidia discrete graphics, large battery, and no-compromise keyboard. These are features you expect in a high-end notebook, but not necessarily in a 2-in-1 that’s meant to serve double duty as a tablet. To top it all off, the Spectre x360 15 isn’t particularly expensive, given its specifications. Our review unit had an Intel Core i7-7500U, 16GB of RAM, a 512TB SSD, and Nvidia GeForce 940MX for $1,500. The newest configuration with Intel Core i7-8550U, 16GB of RAM, a 512GB SSD, and Nvidia GeForce MX150 also goes for around $1,500. While that’s expensive, it’s quite a fair price for everything that’s included. Given its lofty aspirations, then, did HP manage to make a machine that doesn’t compromise power for flexibility? At first glance, the new Spectre x360 15 looks a great deal like a blown-up and repainted version of HP’s current 13.3-inch version. 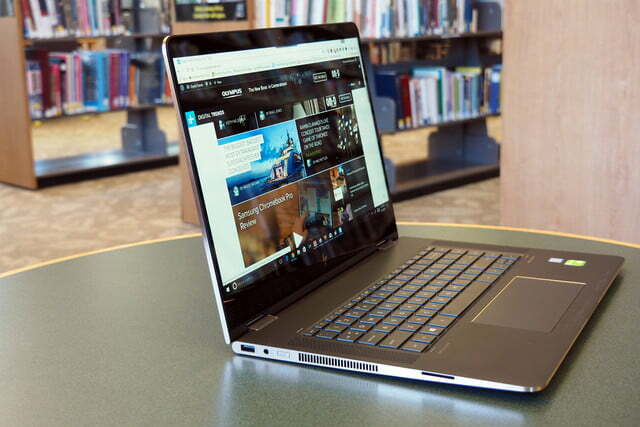 That’s not a bad thing – the Spectre x360 13 is itself a great looking machine that’s elegant and attractive. With its subdued “Ash Silver” color accented in copper and an all-aluminum chassis that feels as solid as it looks, the Spectre x360 15 definitely looks like a luxury laptop. As a 360-degree 2-in-1, the Spectre x360 15 offers the typical four usage modes: traditional notebook, tent mode, presentation mode, and tablet. Of course, it’s a large machine despite the thinner “micro-edge” bezels on each side of the display, and it’s too heavy to use for long in tablet mode. 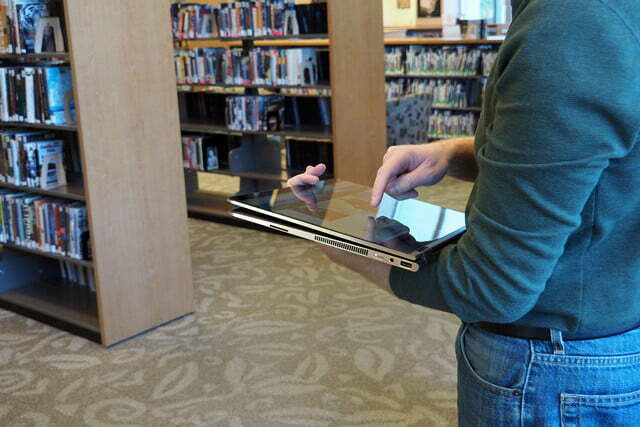 You won’t want to carry it around as a tablet held in the crook of one arm, but it works fine if you have a surface you can rest it on. As usual, the display’s 16:9 aspect ratio feels fine in laptop use, but it’s a bit awkward as a tablet. The Spectre x360 15’s build quality doesn’t disappoint. It’s solid through and through, with no sign of excessive bending or twisting. Even the display, a weak spot with many machines, requires some real pressure before you can get the screen to warp. The hinge rotates easily but maintains its position once in place. You can make it move if you jolt the base sharply, but in typical use it stays firmly in place. We will note that our review unit’s hinge did develop some minor creaking after more long-term use, but we don’t think it’s anything to be worried about, as it hasn’t changed the feel or function of the hinge. 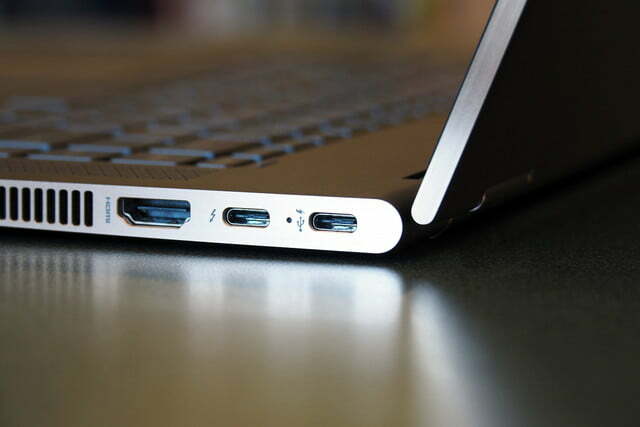 USB-C connections are becoming de rigueur lately, with manufacturers of particularly slim machines including them as the only connectivity option. HP hasn’t followed the industry down that rabbit hole with the Spectre x360 15, choosing instead to include a USB 3.0 port and a full-sized HDMI connection to go along with two USB-C ports. One of the latter includes Thunderbolt 3 support, and both can be used to charge the machine with the included 90-watt AC charger. Wireless connectivity is provided by an Intel AC8265 Wi-Fi adapter with 2×2 MU-MIMO support, along with Bluetooth 4.2. The standard combo headphone and microphone adapter is on hand, along with an SD card slot — a nod to creative professionals who often rely on SD cards to transfer images and video. HP has packed just about every meaningful input technology into the Spectre x360 15, including an active pen and Windows Hello support. It all works extremely well, making the machine as robust in the input department as anything else on the market. To begin with, the keyboard has excellent feel, with sufficient travel and a nice crisp action. Keys require enough force to depress that they don’t feel the slightest bit mushy, and the bottoming action is soft and springy such that even extended typing sessions shouldn’t cause fatigue. Thankfully, the keyboard is also quiet, with only the spacebar on our review unit exhibiting any noise that might interrupt someone close by. In our longer term testing, the keyboard remained excellent and never provided anything other than a comfortable, precise typing experience. 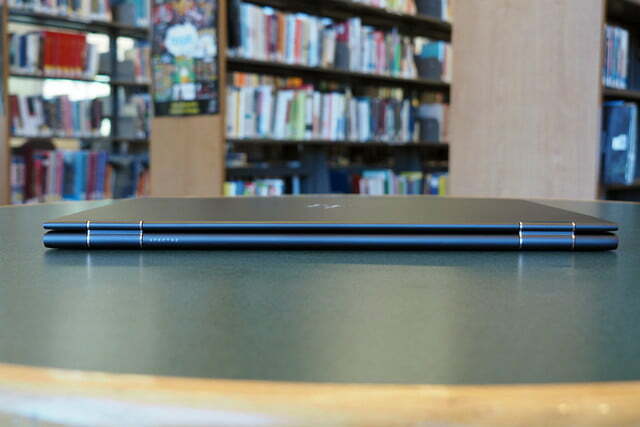 The Spectre x360 15 is a better notebook than 2-in-1, and that’s a good thing. 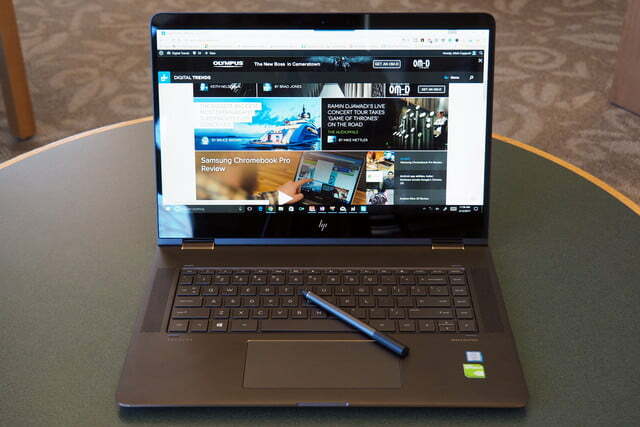 In short, HP accomplished its objective of providing a superior typing experience with the Spectre x360 15. We think it’s one of the better keyboards you’ll find on a notebook today — particularly with Apple abandoning the tried and true MacBook Pro keyboard for the second-generation butterfly-switch version in its new MacBook Pro 15 with Touch Bar. Of course, the keyboard is backlit, which is mandatory today with all but the lowest-end machines. The keys are uniformly lit, with minimal light leak. Oddly enough, there are only two settings, on and off, and so some users might find the lighting a bit bright for dark rooms. A lower brightness option would’ve been welcome. HP calls the Synaptics glass-covered touchpad an “Imagepad,” and it’s rather large, with the same wide aspect ratio as the display. If you’re accustomed to square touchpads, then it might take some getting used to. The touchpad sits underneath your palm as you type, which can feel a bit strange. It has very good palm rejection software, however, so we didn’t experience any inadvertent cursor movement while typing. 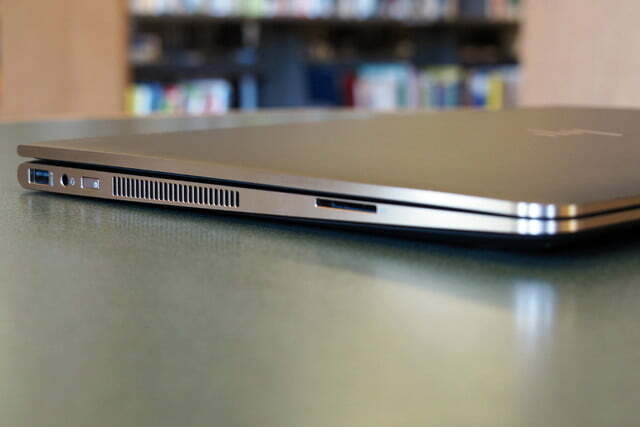 Overall, the touchpad works well, with good responsiveness and gesture performance. One disappointment is that it doesn’t support the Windows Precision Touchpad protocol, which seems to provide the best overall experience in other notebooks. The Synaptics drivers work well and gestures are generally smooth, but there’s some minor lag at times that might have been avoided had HP simply went with Microsoft’s standard. 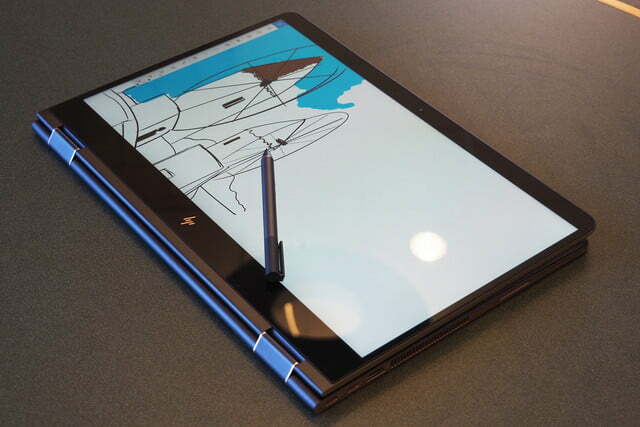 The more Microsoft Precision touchpads that we try out, the more we wish HP had adopted this standard for this machine. Of course, the Spectre x360 15 is a 2-in-1, and so it sports a touchscreen display. In this case, it’s a full 10-point touch display with excellent responsiveness. Flip it into one of its non-traditional modes and you’ll be fully productive swiping, tapping, and typing using the on-screen keyboard. 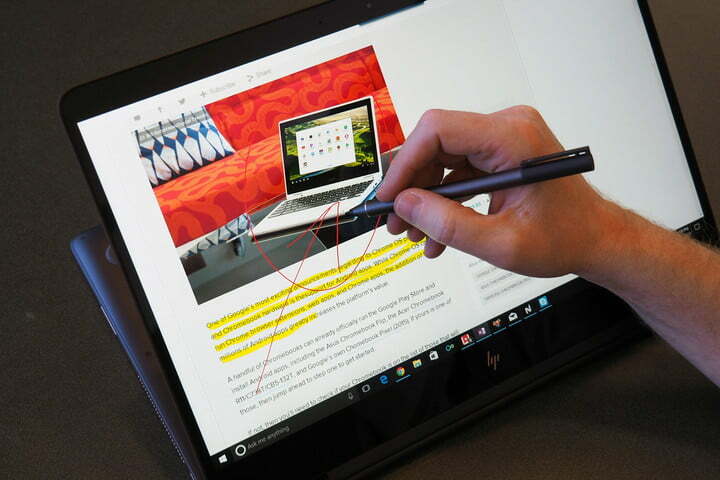 Every new Spectre x360 15 includes an active N-Trig pressure-sensitive pen, which provides another solid input mechanism that greatly enhances the 2-in-1 experience. The pen doesn’t have quite the same feature set as Microsoft’s Surface Pen, particularly the latest version with its 4,096 levels of pressure sensitivity and tilt support. There’s no eraser, for example, or Bluetooth connectivity that pairs the pen to the machine to expand button press functionality. Still, active hover works well, and pen input is smooth and reliable. 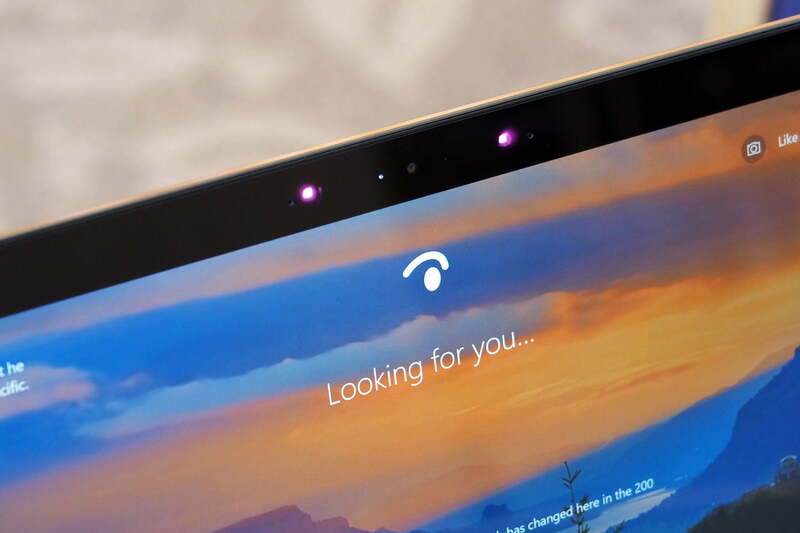 Finally, the Spectre x360 15 has an HP TrueVision Full HD web cam with infrared, meaning it supports Microsoft’s password-less Windows Hello login technology via facial recognition. We tested it throughout the review process and found it to be at least as reliable as the technology used on Microsoft’s own Surface machines. Just open the lid, look at the display, and you’re logged in almost instantly. HP decided to forego the 1080p display option offered with the previous generation, and so this time around you’re “stuck” with a 4K (3,840 x 2,160) resolution 15.6-inch display. In addition, while the last generation used a PenTile panel, the new Spectre x360 15 uses the more standard RGB stripe technology. We won’t get into a debate over the relative advantages and disadvantages of PenTile displays on large notebook screens, but some people dislike the technology, so we thought it worth mentioning that HP made the switch. In terms of objective measurements, the Spectre x360 15 display offers up some good, but not great, results. Brightness is decent at 315 lux, which is bright enough to work indoors but likely won’t be enough to see the screen clearly in sunlight. 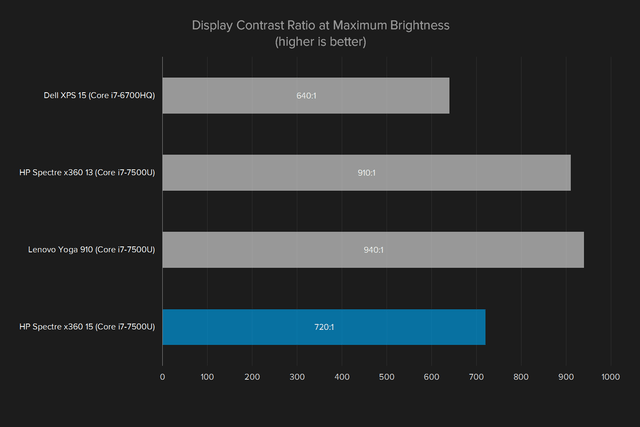 Contrast was, again, good but not great at 720:1 at full brightness, and colors were fairly accurate at 1.95. 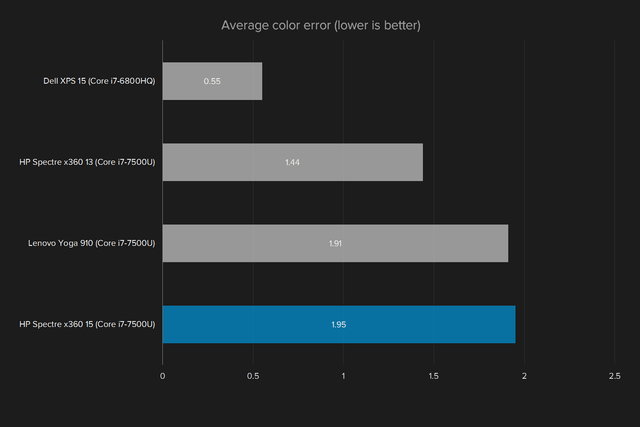 This color measurement is an error reading, so a lower score is better. The HP’s result is about average overall, but some competitors – like Apple’s MacBook Pro – reach a score below one, which is so low that errors become hard for the human eye to detect. 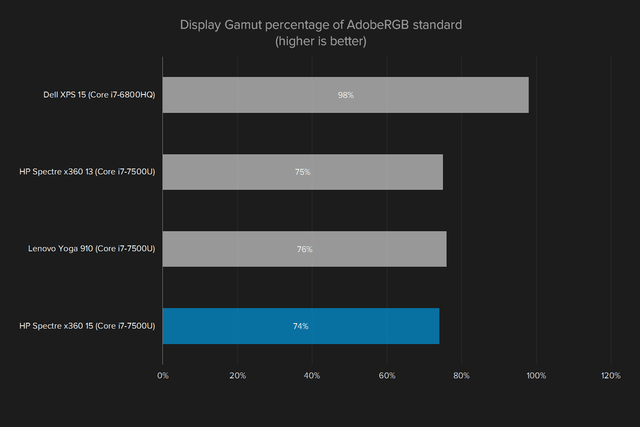 In terms of color, the display’s 74 percent of AdobeRGB and 95 percent of sRGB fell a few points below other machines of the same class, such as the Spectre x360 13 and Lenovo Yoga 910, but are still good results. The display’s gamma was a strength at 2.2, which is perfect — meaning that the display should be neither too light nor too dark compared to source content. Each of these specifications, except for gamma, place the Spectre x360 15 display generally below the comparison machines listed here, but still much better than lower-end machines. Microsoft’s Surface Book 2 has one of the best displays available on a Windows 10 machine, and it’s noticeably better when compared side-by-side with the Spectre x360 15. Despite this, in actual use, the display looks excellent and is a pleasure to stare at for long sessions. Video, especially 4K video, is simply a joy to watch on the expansive screen, with good detail and accurate lighting — bright scenes aren’t blown out, and darker scenes aren’t the least bit muddied. Images also look good, with accurate colors, and using the Spectre x360 15 as a productivity machine is also pleasant. Black text looks excellent on a white background, which is important to anyone who writes or works with numbers for a living. This is a testament to how far notebook displays have come in recent years. These scores would’ve been class-leading a couple years ago. It’s also worth noting that while the Microsoft Surface Book 2 and MacBook Pro 15 with Touch Bar have superior screens, they’re also much more expensive when similarly equipped. And when it’s time to watch Netflix in 4K, the Spectre x360 15 running Edge is our first choice. HP partners with Bang & Olufsen on its machines, with two amplified speakers bracketing the keyboard on the Spectre x360 15. The partnership paid off, with sound that gets loud enough to fill a medium-sized room without breaking down. While bass isn’t terribly robust, it’s not all that bad for notebook speakers, and midrange and high tones come across clearly. There’s also a utility that provides some ability to adjust the sound for music, movies, and voice, and it works — movie audio mates well with the display and makes for a great experience. Notably, headphones also sound great plugged into 3.5mm jack. The machines pumps out serious volume through the headphone jack. While the most recent version of this laptop upgrades to Intel’s 8th-gen quad-core, we reviewed it with Intel’s seventh-generation Core i7-7500U. Toss in the included 16GB of DDR4-2133 RAM, and the Spectre x360 15 promises very competitive performance indeed. Simply put, the Spectre x360 15 leads this pack of machines sporting the same processor. 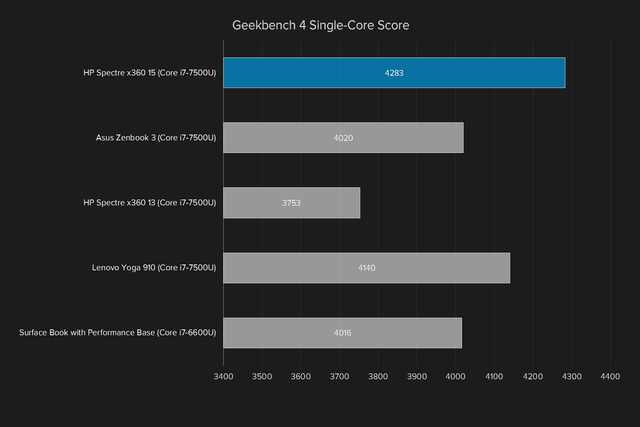 On the Geekbench 4 synthetic benchmark in single-core mode, it was significantly faster than the Spectre x360 13, and meaningfully faster than the Asus Zenbook 3 and Lenovo Yoga 910. Not surprisingly, it also beat out the Surface Book 2, with its previous-generation Intel Core i7-6600U processor. 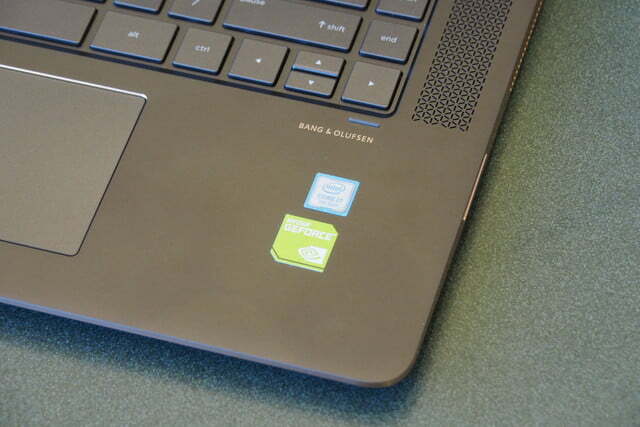 In multi-core testing, only the Lenovo was slightly faster. 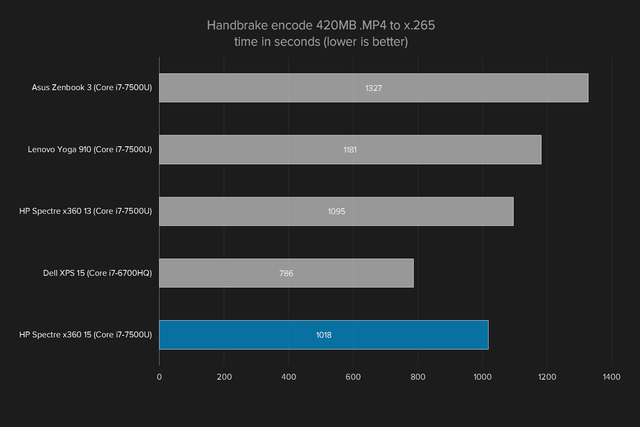 On the Handbrake 4K video conversion test, the HP again provided better performance than all the other systems using the Intel Core i7-7500U. Only the Dell XPS 15 with its quad-core Core i7-6700HQ processor was faster. In actual use, the Spectre x360 15 felt plenty fast. No matter what we threw at the machine, it responded without hesitation. Simply put, it should perform extremely well for any productivity task and for some serious content creation as well. Note that the fans do kick on when the CPU (or GPU, for that matter) is working overtime, and they’re loud. In more typical use the machine remained quiet, with the fans only periodically turning on at low levels that were quite tolerable. We’re looking forward to trying out the Spectre x360 15 with the new eighth-generation Core i7-8550U CPU, which promises up to 40 percent faster performance while maintaining the same power draw as the seventh-generation version. That’s thanks to the switch to a quad-core design, which slows down to save power and reduce heat, but can hit even faster speeds when needed. As for now, you can check out the eighth-generation Spectre x360 13, which saw a pretty significant increase in performance. The Spectre x360 15 review unit came equipped with a Toshiba 512GB PCIe NVMe M.2 SSD. Typically, that technology provides good performance, and HP’s iteration is no different. 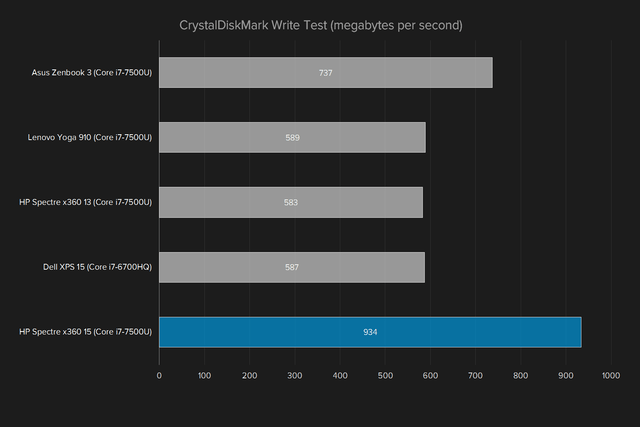 The Spectre x360 15 scored 1,280MB/s on the CrystalDiskMark read test, which is a very good score that’s competitive with all the comparison systems. The Dell XPS 15 and Lenovo Yoga 910 were faster, but not by much. On the same benchmark’s write test, however, the Spectre x360 15 was much faster than the comparison machines, scoring 934MB/s. The Asus Zenbook 3 was the next closest at 737MB/s per second, and the other systems were a little more than half as fast. 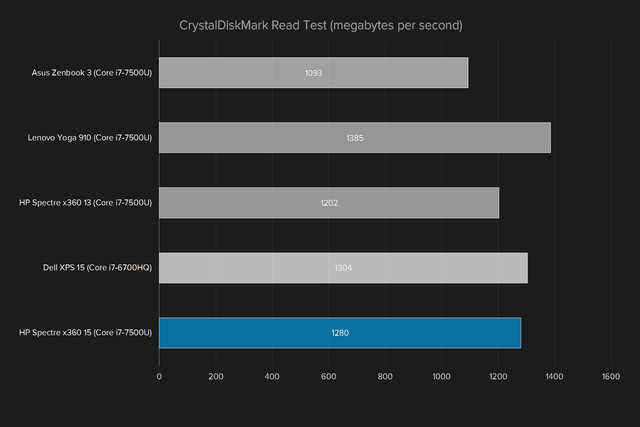 Most modern systems using the same SSD technology are similarly fast, and the Spectre x360 is no exception. Opening applications, accessing and saving files, and loading games was immediate and refreshingly quick. The exceptionally speedy write speed means that the machine will not bog down when editing video, which is a real plus for creative professionals. 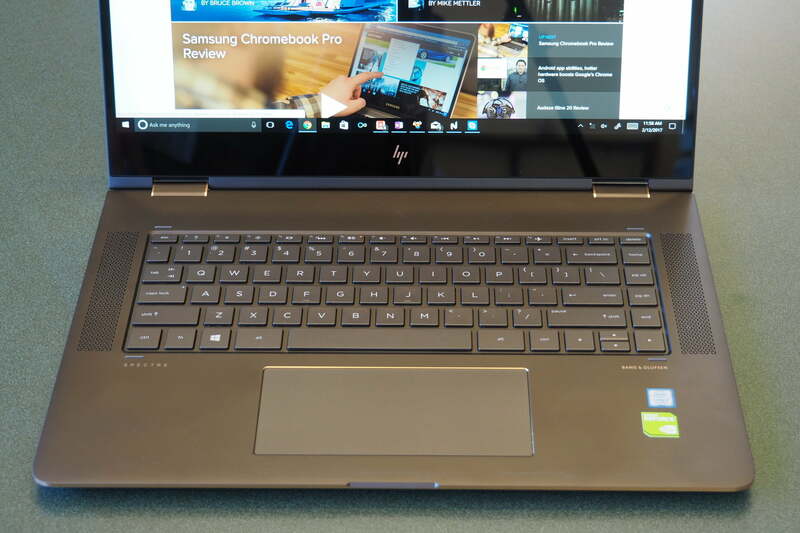 HP included an Nvidia GeForce 940MX in the Spectre x360 15 primarily to help drive the 4K display and to meet the needs of its content creator target market. Indeed, the GPU should help a bit with editing video and the like, but by no means is it a gaming GPU. It’s also well behind newer machines that are starting to ship with GTX 1050/Ti GPUs. 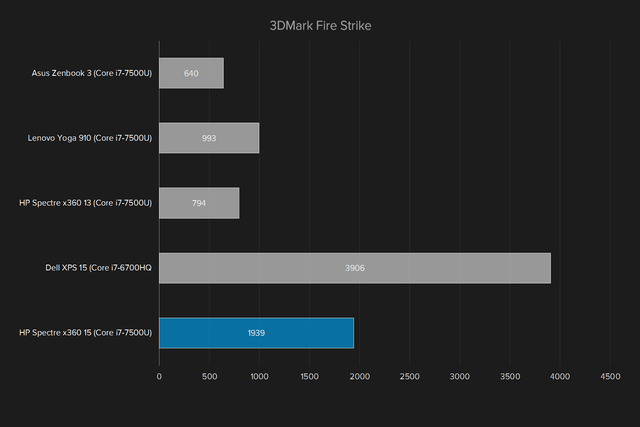 Compared to systems with Intel HD integrated graphics, the Spectre x360 15 looks good. 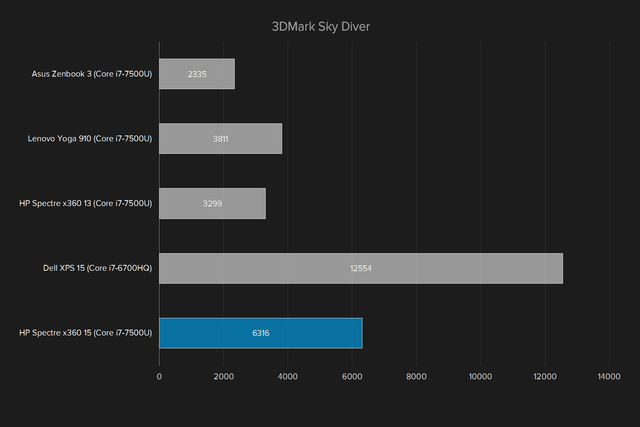 It scored 1,939 on the 3DMark Fire Strike test, and 6,316 on the Sky Diver test, close to twice as fast as the machines using integrated graphics. Of course, the Dell XPS 15 with its Nvidia GeForce GTX 960M GPU was about twice as fast as the Spectre x360 15, which gives a hint as to how much faster newer systems must be with GTX 1050 GPUs on board. These scores are good enough for some light Full HD gaming with older titles, but they hint that running newer games at the machine’s full 4K resolution — or even at Full HD — would be out of the question. We don’t stop with synthetic benchmarks, however. Keyboard, touch, active pen; it’s all here, and it all works. We use Civilization VI, Deus Ex: Mankind Divided, and Battlefield 1, running at 1080P and 1440P, in our reviews. We ran the Spectre x360 15 through each of them, and the only game that the machine could run at something approaching a playable framerate was Civilization VI. And even then, we only managed to squeeze 34 FPS out of the title at 1080p and medium settings. The best Battlefield 1 result was 24 FPS at 1080p, with medium settings. Deus Ex: Mankind Divided never exceeded an average of 11 FPS. Our testing just confirmed our expectations. The Spectre x360 15 has a good enough GPU for assisting with running creative applications, but it’s not nearly good enough for running modern games. As with the new CPU option, we’re also waiting impatiently to try out the upcoming refreshed machine with its Nvidia GeForce MX150 GPU. 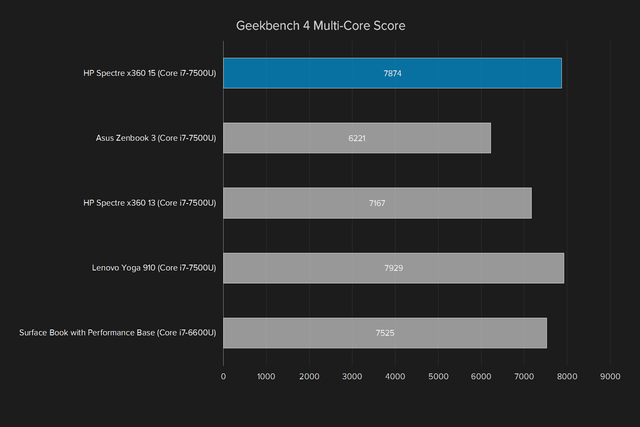 It promises faster performance than the older 940MX, and indeed in our testing of the Acer Aspire 5 equipped with that GPU, we found the MX150 to score significantly higher than the 940MX in the synthetic 3DMark benchmark, and to provide improved performance in some modern games. It’s not as fast as the GeForce GTX 1050, but it’s likely to provide just enough extra gaming performance to work well with 1080p games at medium detail. The Spectre x360 15 isn’t a small machine by any means. 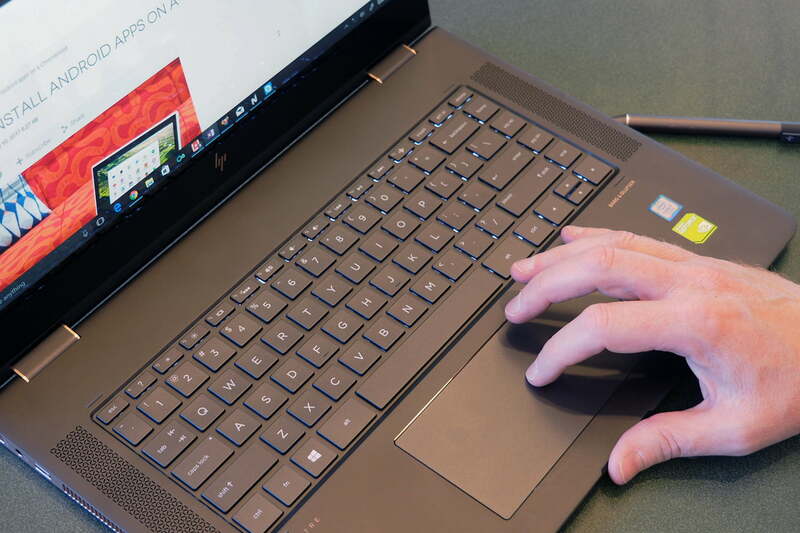 HP made the conscious decision to increase the thickness of the machine over last year’s model, to ensure that battery life, keyboard quality, and connectivity options weren’t compromised. The decision was a good one. All told, the company added just under two millimeters to the machine’s thickness, making it 17.9mm thick. The thin bezels keep its overall dimensions a reasonable 14 x 9.88 x 0.7 inches. Finally, it’s a bit heavy at 4.42 pounds, which is also up slightly from the previous generation. Thanks to the slight increase in thickness, HP was able to increase the battery capacity from 64.5 watt-hours to 79.2 watt-hours. As it turns out, battery life is quite good for a machine with such a large 4K display. In fact, it’s competitive with several machines using the same processor, but sporting smaller displays. Given our results and assuming the display is kept at our tested 100 lux brightness, the Spectre x360 15 can likely last most of a typical workday unless you’re hammering on it non-stop. 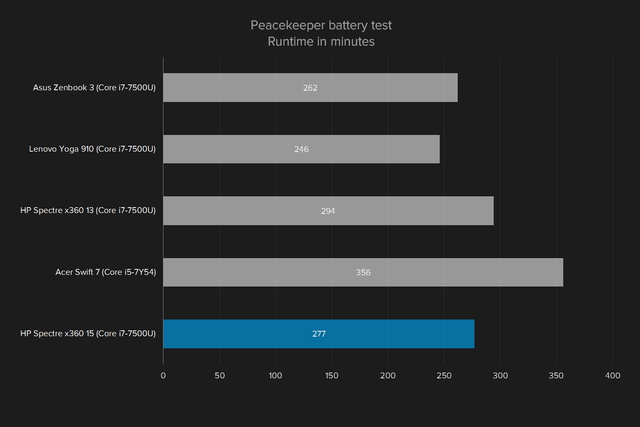 On our aggressive Peacekeeper battery test, the Spectre x360 15 lasted for four hours and 37 minutes. That’s competitive with the four hours and 54 minutes achieved by its smaller 13.3-inch Full HD sibling. In our comparison group, only the Acer Swift 7 with its low-power core i7-7Y54 processor lasted significantly longer. 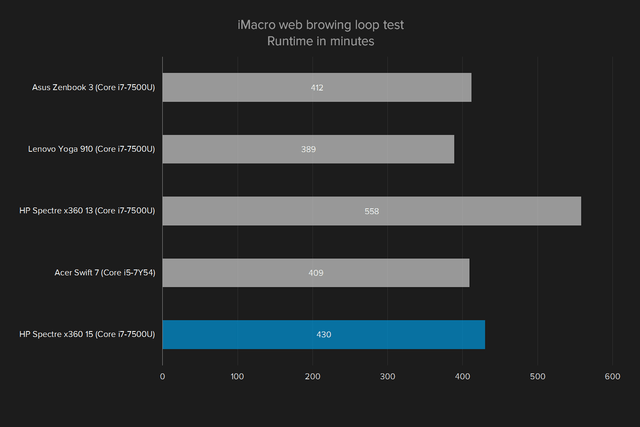 Our web looping test uses live sites with idle time in between page swaps to more closely mimic how we use our machines when browsing. On this test, the Spectre x360 15 lasted for seven hours and 10 minutes, which is about two hours behind the Spectre x360 13 — which is an outlier in this group — but slightly longer than the other machines in our comparison. 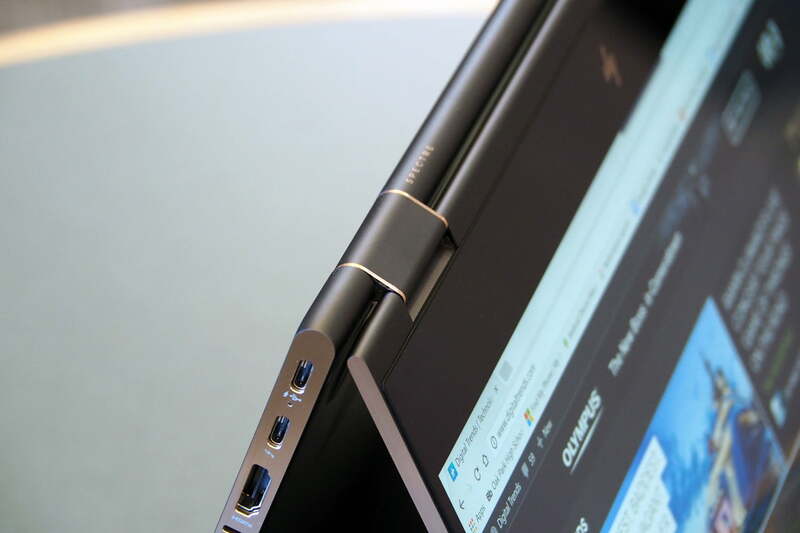 HP has accomplished something special with the Spectre x360 15. 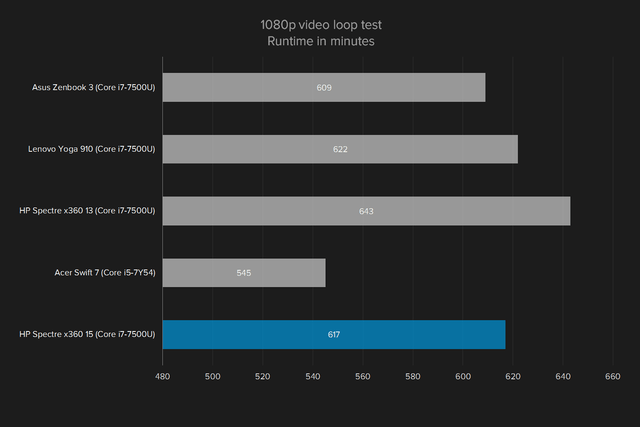 Finally, the Spectre x360 15 lasted 10 hours and 17 minutes on our video looping test, which plays an HD video clip full-screen until the battery dies out. 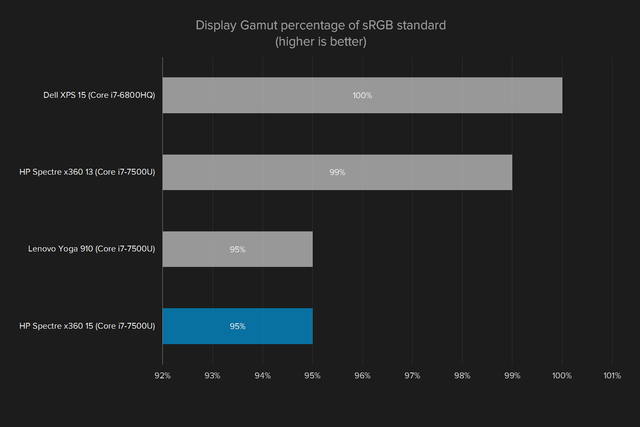 Once again, that compares favorably to our comparison group with smaller displays. Only the Spectre x360 13, with its Full HD display, lasted significantly longer than its larger sibling. HP has built in its Fast Charge technology, which promises to juice up the battery from empty to a 50 percent charge in 30 minutes using the included 90-watt charger. In our informal testing, the feature lived up to its billing. Speaking of the charger, it’s a rather large rounded brick that you won’t want to carry around with you wherever you go. HP provides a one-year parts and labor warranty with the Spectre X360 15, which is the industry standard. You can buy extended warranties starting at $220 for a second year of coverage, or extended warranties with accidental damage protection starting at $240 for two years. The Spectre x360 15 doesn’t come with an inordinately bloated set of pre-loaded apps. There are a couple of games, including the ubiquitous Candy Crush, to go with the usual Microsoft first-party Windows 10 apps. HP includes their typical management utilities, including HP Recovery Manager for performing factory resets and reinstalling drivers and software and the HP Support Assistant app that provides a bevy of system information and diagnostic tools. 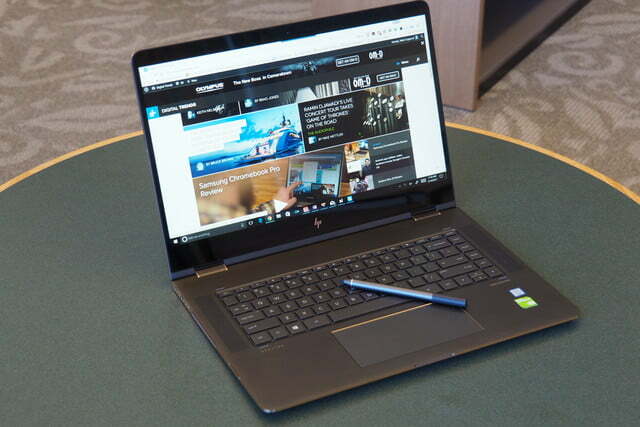 HP also includes an app for adjusting the Bang & Olufsen audio settings, an HP Pen Control app, and HP Orbit that sets up a connection between the notebook and smartphones for transferring files, notes, and links. HP Orbit uses an Android or iOS app to easily pair devices via Wi-Fi, and works seamlessly. HP accomplished something special with the Spectre x360 15. It’s not an inexpensive machine, but it’s nevertheless a no-compromise option that will leave you convinced that you’ve made a great investment. In all its aspects, from performance to battery life to utility, the Spectre x360 15’s whole is more than just the sum of its parts. Admittedly, it makes for a very large 2-in-1 device, but if that bothers you, then just buy it because it’s an excellent notebook and ignore the fact the screen flips around. Finding a machine in its distinct class — that is, 15.6-inch 2-in-1s — is a challenge. At least, finding ones that are as high-quality and offer the same value is difficult. The closest match is the Lenovo Yoga 720 15, which offers a quad-core seventh-generation Intel Core i7-7700HQ CPU, 16GB of RAM, a 512GB SSD, and an Nvidia GeForce GTX 1050 2GB GPU for a similar $1,500. We found it to be a compelling option for someone looking for better gaming chops in a 2-in-1 machine, but it still fell behind the Spectre x360 15 in our estimation based on a mediocre display and more modest battery life. At the same time, the Spectre x360 also competes against higher-end notebooks like the new Dell XPS 15. While Dell’s machine has a seventh-generation quad-core Intel Core i7 processor option and Nvidia Geforce GTX 1050 GPU, and thus offers higher performance, it’s also significantly more expensive at $2,150 with similar RAM and storage. That’s $500 more than the Spectre x360 15, so if you don’t need the XPS 15’s workstation-level performance, you can save some money with the HP and gain occasional 2-in-1 functionality. Finally, the Spectre x360 15 also competes against Microsoft’s Surface Book 2, as both are 15-inch, 2-in-1s with active pens. The Surface Book 2’s “clipboard” tablet component is much lighter and more comfortable to carry around than the Spectre x360 15 in tablet mode. Pen support is similar between the two, as is performance, and so if your tablet use doesn’t require carrying it around in one hand, then the Spectre x360 15 is an interesting alternative — and it offers a $1,300 savings over the equivalent Surface Book 2. On the other hand, the Surface Book 2 has incredible battery life that really blows competitors like the x360 15 out of the water. With its latest refresh, the Spectre x360 15 uses an eighth-generation Intel Core i7 processor, includes a USB-C port with Thunderbolt 3, and supports Windows Hello and an active pen. Those are some of the latest and most relevant current technologies, and they should keep the machine cruising along for a good while. The 1TB SSD option means you’ll be able to store tons of apps and files, and so that component should last for some time as well. The Nvidia GeForce MX150 is also a newer GPU, and although it’s still an entry-level option it’s the latest entry-level option available. If you’re looking at the HP Spectre x360 15, then chances are you’re interested in a machine with a larger display. You’re also probably looking for a traditional notebook first and a 2-in-1 second — otherwise, you’d likely be looking at something smaller. If this describes you, then the Spectre x360 15 is a great choice. It’s not a workstation, nor a solid tablet, but it does deliver an excellent laptop experience at a more reasonable price than its entirely unaffordable peers. Updated with some long-term findings and with information on the new versions with eighth-generation Intel Core i7 processor and Nvidia GeForce MX150 GPU.